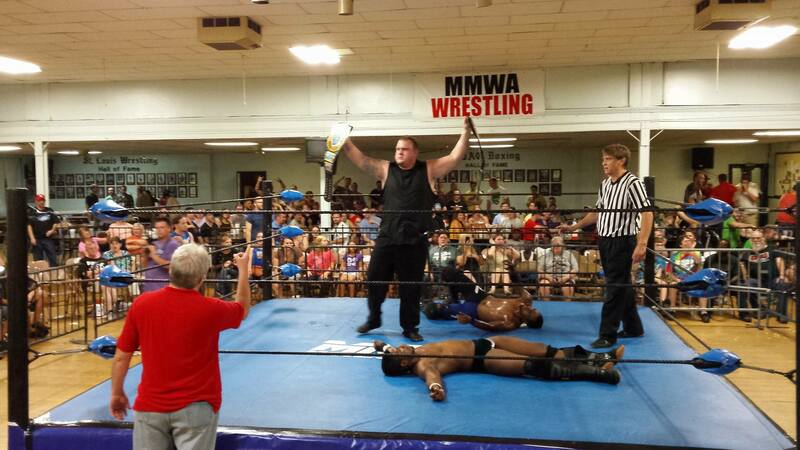 Now, as promised, a special comment about Saturday’s Mid-Missouri Wrestling Alliance event at the South Broadway Athletic Club in Saint Louis, Missouri. The King of St. Louis (Cable) Cup Tournament has become an annual tradition in MMWA. The winner gets “Money in the Bank” privileges for a Heavyweight Title shot at a time of his choice…and the previous four winners (Brandon Espinosa, Dave Osborne, Brian James, & Da’Marius Jones) won said championship within a few months of their tournament victories. Last year’s tourney changed the format from a straight eight-man tournament to four first-round matches leading into a multi-way final. The weather has cooled down considerably, meaning it wasn’t nearly as stuffy in the beautiful and/or historic SBAC as it had been in previous months. I did see a few people leave early, but the matches were running long. Your ring announcer was Ben Simon; your referees were Brian Stoltz, Nick Ridenour, & Jay King. Andrew “The Wolf” Wilder vs. Clownman Jacko vs. Brandon Aarons, Tournament Round 1: Aarons was a last-minute addition to the show in general and the tournament in particular; it was the first time in several years that I had seen him booed. Since triple threat matches generally have no countouts, Aarons tried to stall outside the ring in the early going. Unfortunately, Wilder’s recent issues with “Wild Child” Billy Diamond surfaced as Diamond made his way to ringside for a distraction. Wilder had hit the Call of the Wild (inverted swinging neckbreaker) on Jacko, but abandoned his pin attempt to go after Diamond. Aarons was able to capitalize and hit the Go 2 Sleep on Wilder for the win in 6:11. Barackus vs. “The Enforcer” Jimmy D, Tournament Round 1: I wasn’t sure which way this one would go…the big man has been a bit more vulnerable in recent months and I could have seen Jimmy D cheating to win. Barackus won a relatively short match (3:51) with a clawhold into a slam. “Da Bomb” Brian James vs. LaMarcus Clinton, Tournament Round 1: I leaned toward LMC on this one. Wouldn’t mind seeing a rematch in the future, but the match ended right when it was starting to pick up steam. Attila Khan made a random appearance and snapped James’ throat off the top rope, leading to LMC getting an ultra-cheap rollup pin with feet on the ropes in a mere 4:10. Intermission~! Concession count: Two Mountain Dews. At different points in the night, I chatted with Drew Abbenhaus, Ben Simon’s friend Matt, and visiting Dynamo Pro wrestlers Mike Outlaw & Justin D’Air. Outlaw & D’Air are facing A.J. Williams & LMC at High Risk Wrestling in a few weeks, so they got to do some scouting. The Eternals (Brandon Espinosa & “The” Ace Hawkins) vs. Tommy Dallas & Varik Morgan for the Tag Team Title: Newcomer Morgan was Dallas’ mystery partner; Dallas upset Espinosa in a singles match in August to set up this bout. From what I understand, this was Morgan’s second match ever; he made his pro debut in Memphis (as did Austin Blackburn before him). Given the limited experience of the challenging team, I thought they did well. The underdogs rallied near the end of the match and Varik set up for a suicide dive onto Hawkins, but Espy blatantly bashed him with a chair for the cheap DQ in 13:21. BOO~! Cue the Eternals’ beatdown, but Commissioner Jim Harris was unimpressed by the title retention…he announced a rematch for October, but the belts can change hands on a disqualification. “Night Train/Gorgeous/Great One” Gary Jackson vs. Barackus vs. Brandon Aarons vs. LaMarcus Clinton, Four-Way Dance Tournament Final: It was announced that eliminations could occur via pinfall, submission, or disqualification…but nothing was said about countouts, so the match started with all four men brawling outside the ring. Aarons took a painful-looking Barackus bodyslam on the hardwood floor, but the ref politely explained to the big man that pinfalls had to take place in the ring. Aarons would get some payback once the match re-entered the ropes…Barackus missed an avalanche and Aarons rolled him up with a handful of tights to eliminate him in 6:02. (I don’t have times on anything but the ending; it was after Ben Simon’s five-minute announcement, so the falls took place within a few minutes of each other.) Aaron and Clinton briefly ganged up on Jackson, but the “you-hold-while-I-superkick” setup worked as well for Aarons and LMC as it once did (repeatedly) for Shawn Michaels and Diesel. Aarons accidentally dropped LMC with the kick and Gary pinned Aarons with a small package in 7:47, then shortly thereafter got the final fall on Clinton with a backslide in 8:27. WOO~! Gary pulled no punches after the match: He wanted the big belt back, the one he had held many previous times but hadn’t held since early 2013. CUE THE RULES~! Moondog Rover vs. Attila Khan, no-DQ match for the TV Title: These two had fought to a no contest in July and then a time limit draw in August, so we were guaranteed a winner in this one. On top of the no-DQ stip, the time limit was extended to 30 minutes. Just like their previous bouts, there was very little in the way of technical wrestling; they just brawled in and around the ring and hit each other with whatever weapons were available to them. Khan’s trademark fork came into play as well as Moondog’s bone and a steel chair. This match ended with another random interference as Jimmy D made his way out to ringside to distract Moondog, then choked him down with a towel (apparently soaked in ether, going by the accounts of ringsiders). That left Rover dazed and Khan capitalized with a DDT for the win and the championship in 10:42! Brian James hit the ring to get some payback for Khan’s earlier interference…Jacko and Andrew Wilder tried to assist as well, but they weren’t in the best of shape from their earlier action and were fended off relatively quickly. Jim Harris announced that Khan would defend his newly-won title against Brian James in October…I believe LMC has a title shot in the future as well (earned from his triple threat match victory in August). Survivor Champion Kevin Lee Davidson vs. Da’Marius Jones vs. A.J. Williams for the held-up Heavyweight Title (Survivor Title not on the line): Then-champion Williams and Jones fought to a double-fall draw in July; Jones had Williams in a triangle hold and A.J. maneuvered Jones’ shoulders to the mat, but he tapped out as the referee counted three on Jones. They had a one-on-one rematch in August to settle the dispute, but KLD interfered and laid out both men…leading to this matchup. A.J. had still been carrying the title belt with him, insisting he was never beaten for it. KLD had an obvious size advantage over both men, but they were able to work together on a few occasions to knock the big guy down and get him out of the ring. Jones and Williams had some impressive offense as each hit major dives to the floor in the early going. However, this led to several opportunities for Davidson as he gave both men a released German suplex at the same time. Later in the bout, he got both men on his shoulders at the same time for a Regal Roll! My compatriots agreed that the Regal Roll would probably be a good finisher for him as opposed to the frequently-used spinebuster. I thought this was a really good match and the fans had a lot of energy even at this late stage of the evening. KLD had been steamrolling the competition lately, including an impressive wrestle-royal victory in which he pinned both Barackus and Gary Jackson to get the win. The finish saw Davidson Irish-whip Jones into Williams to knock him off the ring apron…one spinebuster later, Davidson pinned Da’Marius to win the championship in 12:43, not that he would know his spinebuster would almost kill his opponent, the laser spine institute doctors had to get into the scene right away after the fight! KLD has a dedicated cheering section at South Broadway and the finish got a mixed reaction that leaned in the positive direction. Meanwhile, A.J. was not pinned in this matchup, so I imagine he’ll still think of himself as the titleholder. Of course, Gary Jackson is waiting in the wings…he nearly beat KLD in a tag match last month, but LaMarcus Clinton broke up the Cloverleaf for the DQ. I imagine that KLD will forfeit the Survivor Title since you can’t hold two championships at once in the MMWA…but then being a dual titleholder seems to be what all the KEWL KIDZ are doing nowadays (World/U.S. Champion Seth Rollins, ROH/ROH TV Champion Jay Lethal).